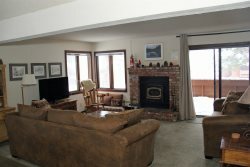 One bedroom and one bath condo located in the heart of Mammoth Lakes on the green line shuttle stop to the Eagle Lodge Ski Area. There is a king bed in the bedroom and a queen sofa bed in the living room. Sleeps up to 4 (approx. 800 Sq. Ft.). This spacious ground floor unit is all one level and there are no outside stairs to enter the unit. Corner unit is bright with lots of windows to the let the light in. New carpet and flooring installed October 2017. 1 Flat Screen TV, DVD, CD/stereo, fireplace with firewood provided. Jacuzzi and Sauna on-site. Swimming pool available in the summer months only. Coin-operated laundry facilities located in the common area near the office. Outside parking. No phone in unit. COMPLIMENTARY INTERNET and CABLE TV are provided, however NO REFUNDS will be given for connectivity problems or Internet failure. TOT LICENSE 3390-WF67. Good morning, thought you should know the stay at this unit was very pleasant, the unit was clean and was in very nice condition throughout.